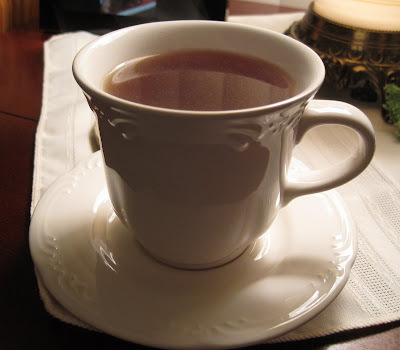 I often write about how much we love tea. Last weekend, we visited a tea shop in Castle Shannon, Cammie Sin's Tea Boutique. We were very excited to learn of this shop and even more excited to discover the shop sells the Metropolitan teas, which are the same teas that Te Cafe brews and sells. While we would love for Cammie Sin's to sell tea by the brewed cup for sampling, we were happy enough to open the glass canisters and smell the heavenly tea smells. The above photo shows the White Chocolate Mousse tea (black tea, white-chocolate pieces, calendula and sunflower petals, natural flavors). The woman in the shop was kind enough to give me a sample pouch so that I could try it instead of purchasing an entire bag of it and possibly disliking it. I do like it. It has mini white chocolate chips in it! I purchased a bag each of the Pumpkin Spice (black tea, hibiscus, rosehip, almond pieces, rooibos, vanilla pieces, cinnamon pieces, apple pieces, natural dried orange, sunflower and calendula petals, triacetin, natural flavors) and Lime tea (black tea, lime leaves, natural dried lime (no peel), natural flavors): In the Pumpkin Spice tea, you can see little chunks of dried goodness mixed in with the black tea leaves and in the Lime tea you can see bits of dried lime. I think the Lime is better chilled than hot. About a month ago we were browsing in Sur La Table when I spotted a little Bodum press, which can be used to brew tea. We thought it would be great for me in the afternoons. I could brew some loose leaf tea, and carry it into the living room before it is fully brewed and not spill any since there's a 'lid.' I hate when I am pushing myself over the carpet with a mug of hot tea nestled in my lap and it sloshes out all over. Or when I take a not fully brewed mug of loose leaf tea into the living room and somehow when I remove the brewing cup/ball, I leak tea all over or it somehow rolls onto the floor or tips wet tea onto the table. Our brew baskets are no longer flat on the bottom so they easily tip over. Anyway, I have been loving this press pot. It makes about 12 ounces of tea, so a bit more than a tea cup and just about right for a large mug. 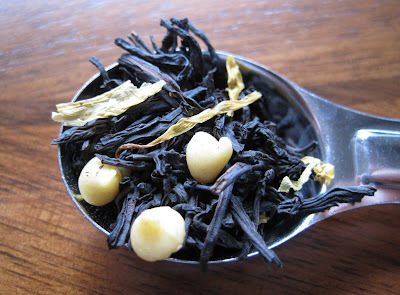 The last couple of afternoons I've brewed myself a cup of the White Chocolate Mousse tea. At first, the tea leaves swirl about an float. Gradually, they dampen and sink to the bottom. After 3-4 minutes, I press the plunger and voila! 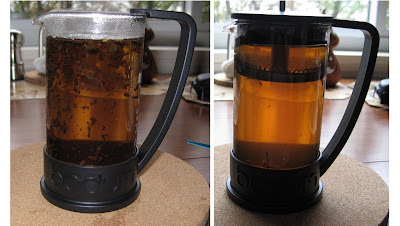 Fresh brewed loose leaf tea. Especially nice on the chillier afternoons. I like to have a hot mug to wrap my hands around because my hands seem to easily get really, really cold. Last Saturday we also stopped in The Pie Place. There's no way we could stop in a bakery and leave empty handed. I got a cinnamon bun biscotti: It was tasty, but more cinnamon bun taste than cinnamon taste - yes, there is a difference, to me, and I would have preferred just cinnamon. Also, it had raisins, and I don't like raisins. I didn't realize there were raisins when I opted for it. SP got a mini triple berry tart: I had a small sliver and it was quite good. I really like the crust. The berries were good, too, not too sweet and not too syrupy. 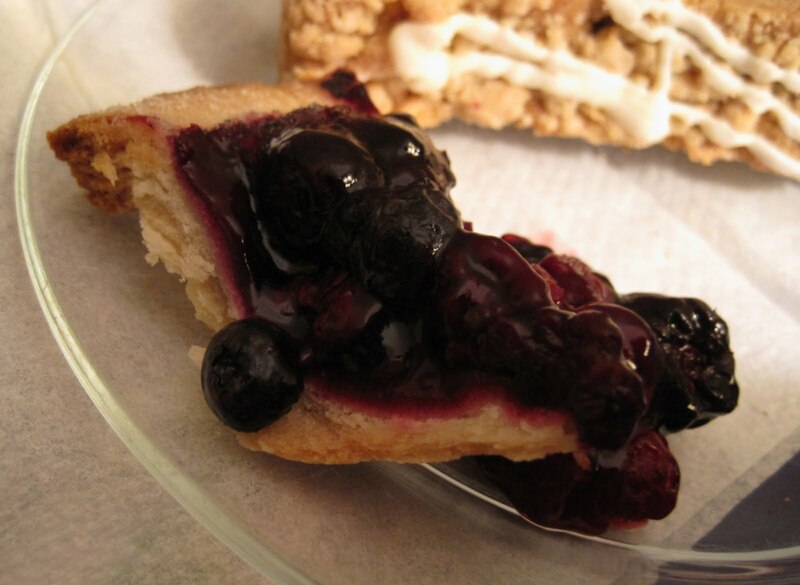 Much like Bethel Bakery, it's a good thing we don't live closer to The Pie Place! I always want to love The Pie Place because, well, I love pie. But every time I go there I'm disappointed with the price to quality ratio. Much prefer a pie from Portman's for half the price.